Do you want to know the best acrylic pouring recipes? More and more people are creating amazingly colorful artwork by simply pouring paint on canvas, using special yet simple techniques. Many of those passionate DIY crafters call themselves pour painting or fluid artists and successfully sell their fluid art on Etsy, while others are just switching from coloring pages to something a bit more creative yet still relaxing and don’t care much about an art career. 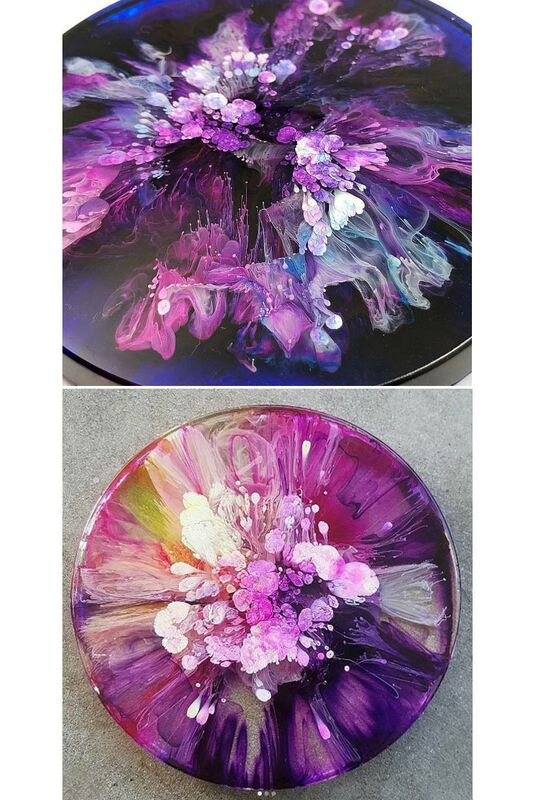 Either way, both groups are constantly looking for new interesting acrylic pouring recipes, techniques, and pour painting tutorials thus pushing acrylic pouring art into new territory of popular DIY projects. We collected a few pour painting tutorials right here for you to master resin poring techniques and learn about some alternative art materials. This is a really good book for fluid art beginners. 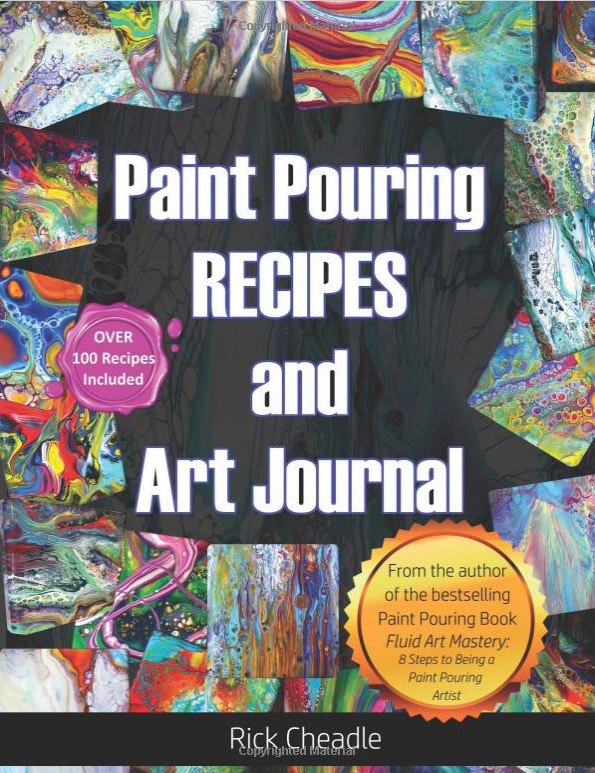 The recipes are formulated for an 8″ x 11″ or 9″ x 9″ size canvas and provide the exact amounts of paints and other components needed for each pour. BEST OCEAN WAVE Acrylic Pour EVER!!! CraftyJen has seen others doing the wave paintings using acrylic pouring techniques on canvas and attempted to create one of her own. It turned out to be really artsy! There can be no precise acrylic pouring recipe for each painting – this is the beauty of the pouring technique. Every time the paint mix touches canvas you will get a different result and will create something unique. This is an interesting pour painting experiment to watch which will create a complex symphony of colors on canvas using flip-and-drag technique plus a swiping acrylic pour medium technique. Fascinating! Well, for creating a museum-quality painting using acrylic pouring techniques on canvas, you definitely need to think about your color scheme and all the steps in the video. You would also need to do your research and use fine art professionals’ expertise to learn if including silicone oil into any of your acrylic pouring recipes is compatible in any way with this museum-quality label. Below are a few art oils that artists can purchase at any art supplies store. The most common is linseed oil, stand oil (a less liquid version not suitable for acrylic pouring), and walnut oil (not shown). Acrylic pouring authority figures do not recommend using organic oils stating that they will go rancid upon drying, will smell bad, and rot. If this was true that all art museums with oil paintings would be smelling like dumpsters. What’s the solution then? Just add a few drops of Spike Lavender essential oil (sold in art stores) to linseed or walnut oil like thousands of fine artists have been doing over 100s of years. And, please, don’t use your cooking oils. …Silicone oil is a non-drying lubricant that works wonders on squeaky wheels but may produce unpredictable results inside the acrylic polymer and absorb dust particles over long periods of time. Mely starts by showing some of her new pour paintings and explaining what techniques were used in each case. After that, she demonstrates some of her techniques using Golden Fluid & High Flow acrylics and Liquitex Pouring Medium (GAC800). She adds a few drops of water in the Golden Fluid and then pours the paint on 26″x48″ cradled wood. Using a hair dryer for pushing the paint she creates some remarkable expressionistic effects. This informational demo is one of the best showcases of acrylic pouring medium techniques you can find online. What do art & hair have in common? The blow dryer! Here is another demo of using a hair dryer for creating an expressionistic fluid artwork. You may like it or not but it shows that there are many ways fluid acrylics can be poured and spread around the canvas creating a mesmerizing effect. A true piece of art should always arouse some level of emotions, otherwise, it is just a decorative craft panel. In this pour painting tutorial, Mely shows how black, magenta and white colors can be used for creating quite a dramatic artwork. No amorphic cells here! 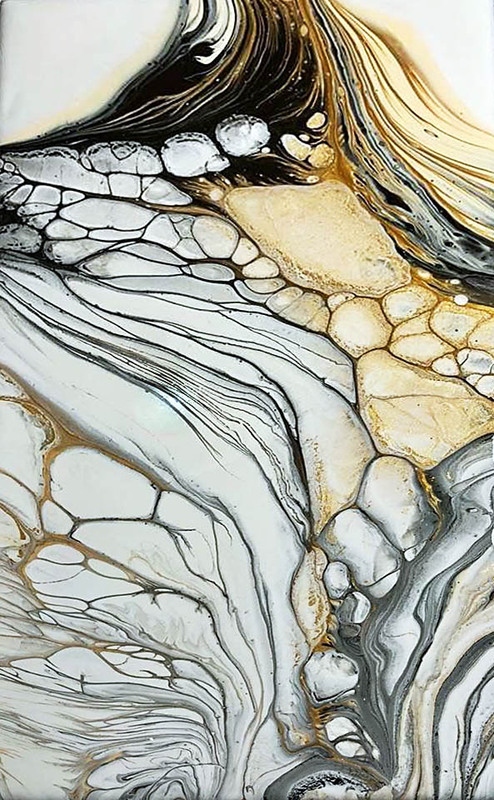 In her artistic endeavor, she really extends acrylic pouring techniques on canvas beyond common “pour and hope” approach. Paints were poured on a 10″x10″ canvas and moved around by slanting the canvas. Then a hair dryer on a low setting was used to push the paint around. A nice result which you can repeat at home on your own DIY canvas! Do you have a modern interior? Do you have a pair of hands and a will to learn? This pour painting tutorial video will show you how to make something cool and modern out of a very limited set of colors. 3 compulsory colors: metallic blue, purple, and yellow. Elegant Negative Space Acrylic Pour – Fluid Painting made Easy!! For beginners, Acrylic pouring techniques on canvas always mean cells, cells, and more cells! Not so for the author of this pour painting tutorial demonstration. 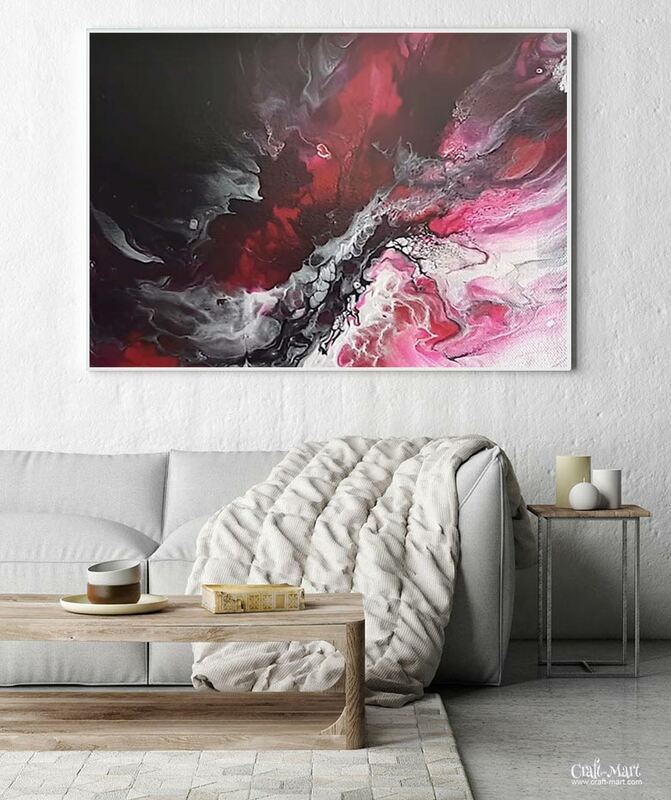 Watch how a limited palette, negative space, and expression through some sharp contrasting graphics would transform simple acrylic pouring on canvas into a piece of abstract fluid art. Pour painting can be done with any liquid paints. FluidArt experiments should inspire fluid artists to go beyond standard acrylic pouring recipes. After looking at these acrylic pouring recipes and techniques, let’s mention one fun crafty DIY project that a growing number of “pour painting” art enthusiasts is doing now – making pendants, pins, earrings, and some other jewelry-type trinkets with pour paint leftovers. Quick and easy craft projects to ‘wet your toes’ and try exciting new acrylic pour painting recipes and techniques!